Puerto Vallarta or PV as the locals call it, has a long history of honoring and preserving its cherished environment. Festivities honouring the Virgin of Guadalupe and Mexico’s history with fireworks and church bells are a common occurrence. Evidence that ecotourism and preserving what Mother Nature provides is highly evident in Vallarta through use of natural elements in their brightly colored art, décor, and clothing. Detailed artistry depicting the ancient symbols of the Huichol Indian tribes show a clear connection between sea and land. The Huichol believed that life began in the ocean and then evolved to land. The thread of preserving what Mother Nature provides does not stop with ancient symbols. It continues through to the conservation and responsible use of the oceans and land surrounding Puerto Vallarta with a strong presence of ecotourism. PV is one location where you can swim with wild dolphins in their natural habitat, not in a tank. Wildlife Connection is a research facility that offers biologist run eco-tours to give travelers the chance to experience what dolphins are like in the wild – where they are happy and free. Tour attendees assist the biologists in discovering the intricacies of dolphin life by allowing the scientists to study the interactions between humans and dolphins. I spoke with a biologist about discoveries surrounding the Bottlenose dolphins of Banderas Bay. He stated that they are learning that the dolphins are residential, meaning that they live in the bay raising their young. They have seen several generations of dolphins because the adults frequently bring the young to the boats to play and interact with swimmers. The biologist also told me that the dolphins have precise “clicks” and “sounds” that they use as identification. In the same way that we have specific names which we are known by, dolphins have particular sounds that resonate as names in dolphin language. Since the dolphins are free roaming in the wild, the biologist made sure that we understood that we had to find the dolphins and go to them, not the other way around. It did not take us long zipping around in the tour boat to locate a small pod. Unfortunately, there were no young at this time, but they did come close to check us out. Swimming with the dolphins was exciting. Back on land, I decided to hunt for a place to relax with a cold drink that had an upbeat atmosphere. I found that at Los Muertos Brewing Company in Old Town. Conner and Stephanie Watts, Utah expats, looking for warmer weather and a challenging adventure created Los Muertos Brewing Company. It was the first craft microbrewery in Puerto Vallarta. This little slice of home in paradise opened at the corner of Lazaro Cardenas and Calle Constitucion in 2012. 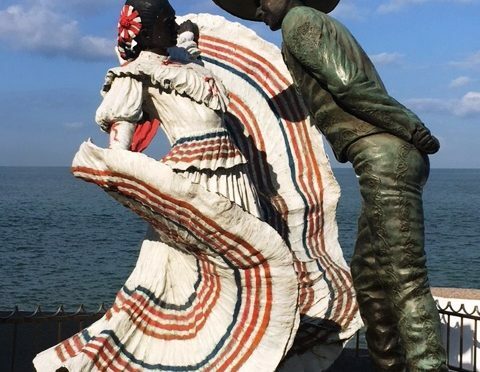 The brewery derives its name from Los Muertos Beach, which is also the location of the couple’s wedding before they moved to Puerto Vallarta. Brightly polished copper and silver fermentation tanks line the wall behind the counter. The smell of hops and pizza fill the air. Walking in, it was as if I was at a brewhouse in America. Listening to conversations around me between friends catching up with each other, I felt as if I was on the set of the 1980s tv show “Cheers” – where everybody knows your name. It was a comfortable and relaxed feeling – before long I was in one of those conversations and felt like an old friend. The Watts say that one thing which sets them apart from other breweries that have opened recently is that Los Muertos focuses on offering an authentic pub atmosphere with food and entertainment. Los Muertos celebrates both American and Mexican holidays with pub favorites, plates for kids, ladies night, and of course, green beer pints for St. Patty’s Day. “The main thing that sets Los Muertos apart from other pubs is that the majority of what we serve is brewed by us, right here,” Watts says proudly. Los Muertos brews a selection of summer wheat, ales, IPAs and stouts. My favorite was the Anillo De Fuego Ale with serrano peppers. With just a bit of kick, it was the perfect base for a spicy Mexican Bloody Mary. Something else that I thought was unique and fun was the labels. Each variety has an interesting design featuring Day of the Dead figures called Catrinas. There are pirates, Scotsmen in kilts, Mexican banditos and even a German barmaid wearing a lederhosen. The Watts say they capitalize on offering their regular customers the authentic pub experience of bonding with friends that they are missing from whatever part of the world they are from. I could imagine myself being a regular there, enjoying a pint with a slice of pizza. This was very interesting, thanks for sharing! Hi Kasey! I am glad you liked reading about Puerto Vallarta. Thanks for commenting! Eco-tourism is such an important concept. I just read a piece about this in the Times regarding New Zealand and how important this is to the locals there. And gosh, Puerto Vallarta looks sooo beautiful! That visit looks like so much fun, sigh. Hope to reproduce it some day! Hi Izzy! PV is beautiful. It is a wonderful mix of traditional Mexico with a new and modernized Mexico. Experiencing the dolphins was amazing! Thank you for commenting. I wouldn’t have figured Puerto Vallarta for somewhere you could get a good micro brew, that’s awesome! Thanks for sharing! Neither did I! It was great! Thanks for commenting!